There are tough decisions, and then there are tough decisions. In business, difficult choices are almost run-of-the-mill. They have to be made every day by someone who can handle the mantle of responsibility. But every once in a while, the entrepreneur is faced with the kind of decision that’s far tougher. It’s worse than simply having to choose the best option— it’s having to choose the least horrible one! What’s tough isn’t just deciding which way to go; it’s having to decide at all. We were faced with a decision like that recently regarding our software company, WebinarNinja. Choosing the lesser of two evils was no walk in the park. In fact, I wasn’t sure if I actually wanted to share it publicly on the show! In the end, this podcast is about helping our listeners learn from our experience. 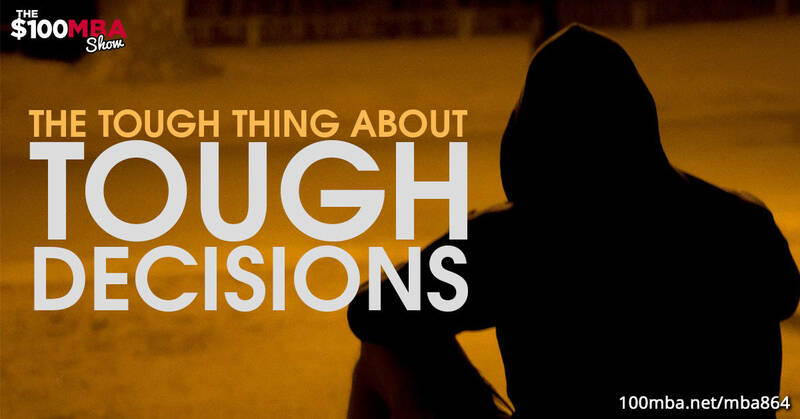 As tough as this decision was, it taught us something— and we think it can teach you something too. Click play! We love having great advertisers support our show. But, in order to continue doing that, we need your help. Go to podsurvey.com/MBA and take a quick, anonymous survey that will help us get to know you a little better. That way, we can show advertisers just how great our listeners are. Plus, once you’ve completed the survey, you can enter to win a $100 Amazon gift card.